Click "Add" to add new rss stream, "Edit" to edit and "Delete" to delete existing streams. 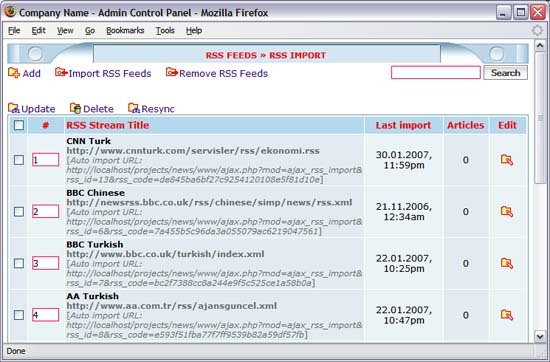 Click "Update" to update orders of streams, "Resync" to make order numbers continuously from 1 to n.
Click "Import RSS feeds" to import articles from rss streams (you can also click on auto import url). Click "Remove RSS feeds" to remove articles which have been imported.